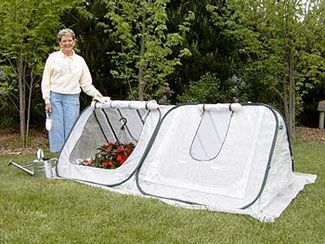 The StarterHouse portable cold frame is compact and lightweight for easy transport, setup, and take down. No assembly is required. The 100% waterproof Gro-Tec™ material is UV resistant with rip stop protection for longer life of your greenhouse. The StarterHouse model has 4 vent openings in the top to provide optimum air circulation. With the vents open, outside air circulates throughout the StarterHouse to prepare plants for planting in outdoor conditions. With the vents closed, your plants remain protected from insects, birds and other pests, as well as wind, frost and snow. Now you can garden year-round! It is also a great pond cover for water plants and is perfect for starting seedlings. The StarterHouse cold frame can hold up to 16 flats.